If you want to take the graduate level course for credit in an accredited program, the cost is $750 (+$50 distance/online fee, if you will not be present in Grand Rapids, MI in person). PRTS is accredited by ATS & ARTS. ATS accreditation is accepted in the U.S. and Canada. For other countries, you would need to consult the registrar at your home academic institution. If you want to take the course as an audit, the cost is $180 (+$50 distance/online fee). If you register as a new student at PRTS, you have from Nov. 2 until the first day of class (Jan. 19) to register, although you need to allow for time to submit an entrance exam. If you are a returning student to PRTS, you have from Nov. 2 to Nov. 18 to register. If you have not taken the intensive Latin course at PRTS, applicants will need to successfully complete a timed entrance exam before being admitted to the class. If this exam will be proctored for distance students, please contact the registrar to make arrangements. This course will be streamed live via PRTS/Populi system with audio/video recordings of lectures available to students of the course. For more information, please direct your inquiries to the registrar at PRTS, Jonathon Beeke, you can e-mail him or call him directly at (616)-432-3408. Stay tuned, the syllabus will be available through PRTS soon. This semester the Junius Institute is pleased to announce that our monthly colloquium will be hosted at two seminaries in Grand Rapids, MI, Puritan Reformed Theological Seminary and Calvin Theological Seminary. The event is free to the public. We are also streaming the events live on YouTube. More details to follow, so stay tuned. Below are our topics this Fall. This Friday at Puritan Reformed Theological Seminary, Todd Rester will discuss the importance of recovering a body of theological and philosophical terms for the study of intellectual history, theology, and philosophy. We will also introduce the Lexica of Early Modern Philosophy & Theology project, a new tool that is a crowd-sourced project that employs elements of research methodology, historical theology, TEI (Text Encoding Initiative) standards, and Latin paleographical techniques to develop a resource for theologians, philosophers, historians, and graduate students. The Junius Institute is pleased to announce the launch of a new project called “Digital Companions.” The idea for this project is to produce open-access digital editions of translations, enhanced with specialized and integrated hyperlinks, paired with the original language text. A key work by the institute’s namesake, Franciscus Junius, has the honor of being the first such Digital Companion. Partnering with Reformation Heritage Books, who recently published Junius’ A Treatise on True Theology, our JI Companion links the English text on the left hand side with the printed edition of the Latin (1613 edition) on the right. Of course there are some places where the English version has no analog in the original, such as the front matter and other introductory material. But as you scroll through the contents of the source document itself on the left, the Latin page will sync on the right, making reference to the original Latin much easier as you read along. JI research curator David Sytsma developed the companion, which includes embedded hyperlinks to other sources that are referenced as available, as well as links to author pages on the Post-Reformation Digital Library. So, for instance, when Richard Muller refers to the “friendly correspondence” between Junius and Jacob Arminius in his foreword, there are live links to both the English translation (via the Internet Archive) and the Latin text (via Google Books) embedded in the companion. Dr. Sytsma has also developed pop-ups so that when you hover over certain links you can get an overview of the person and his or her work. There are a number of other features that you will encounter as you explore the companion, including references to the pagination of the printed text as it appears in both the English and original language publication. And speaking of the published text, be sure to check out the printed version from Reformation Heritage Books for your bookshelf. This is technology that can be used anytime regardless of access to the Internet! We have plans to develop other digital companions in the future, so stay tuned. 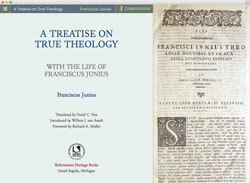 And in the meantime, please be sure to explore the JI Digital Companion to Junius’ A Treatise on True Theology and let us know what you think. A generous benefactor has put up $1,000 of matching funds for donations raised through the end of this calendar year. Please help us to maximize our ability to digitize early modern texts in theology by contributing to our fundraising campaign. The opportunity to double your donation ends on December 31, so please don’t delay! And peruse some of the first fruits here.